Easy to use button release operated by fingers, palm or side of hand. Includes 5" wheels plus rear glide caps allowing use on all surfaces. Comes with a paddle folding mechanism for easy operation and the legs also fold up making it perfect for transportation or storage. This model comes with both extension legs and 5" wheels. The wheel configuration allows the user to turn around easily and safely in an area as small as 29 inches, and at only 22 inches wide! Hospital Walkers are great for individuals who need assistance walking or moving around, but do not want to lose their independence. Wheeled Walkers allow the individual to roll the walker across the floor while moving. 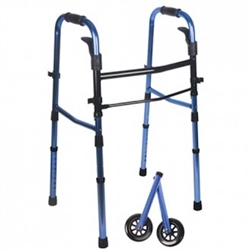 With Standard Walkers, the individual needs to lift the walker forward after every step. Most walkers fold up for easy storage and portability.